If there's a gov't payment problem to people inside the border, that's an entirely different issue. Big update on this issue! While we are all optimistic on this issue, knowing China's past record on counterfeit products and intellectual property theft pledge this seems to be more of a hollow promise for optics than for substance. Donald Trump is repudiating nine super-PACs supporting his presidential bid and calling on his rivals to disavow all supporting super-PACs days after a Washington Post story suggested a connection between an outside group and Trump's campaign. "I am self-funding my campaign and therefore I will not be controlled by the donors, special interests and lobbyists who have corrupted our politics and politicians for far too long," he said in a statement released Friday. On Monday night in the White House President Donald Trump celebrated the passage of the First Step Act. President Trump designated April as the First Step Act Month. The program includes cutting prison sentences for thousands of federal inmates. During the ceremony Trump noted that Americans with criminal backgrounds are unemployed at rates up to five times the national average. “Me and the president didn’t get started on the best foot. I was one of the 16 people he beat and he reminds me of that every day,” Graham told a crowd at a rally held Saturday in Brushy Creek Baptist Church. “Right after he got elected, he said, ‘Come over, I want to talk to you.’ I said, ‘I’ll be there in a minute.’ He said, ‘I don’t have your phone number.’ I said, ‘There’s a reason for that.’” The crowd laughed. Graham was referencing then-candidate Trump’s release of Graham’s personal cell phone number. Vice President Mike Pence participated in support of Graham at the South Carolina church. “I found common ground with President Trump: I like him and he likes him. It seems to be working out for the both of us,” Graham joked to more laughter from the crowd. Special Council Robert Mueller concluded his investigation into 2016 Russian election meddling and handed his report over to U.S. Attorney General Bill Barr. Barr issued a brief letter to members of Congress revealing summary findings of Mueller’s report that confirmed neither the president nor his campaign associates colluded with the Russian government during the election. Barr’s letter further revealed that there was no collusion despite numerous offers to do so. According to a new study from the Asian Americans Advancing Justice-Asian Law Caucus and the University of Oxford Centre for Criminology-Border Criminologies, California's implementation of its "California Values Act" sanctuary cities law is not going particularly well. In fact, sheriffs in roughly half the state's jurisdictions are actively resisting enforcement of the measure. Conservative Wins HUGE Upset in Wisconsin Supreme Court Race, Will He Survive the Recount? When I say huge, I mean huge. This essentially assures the Wisconsin Supreme Court stays conservative for the next decade at least. Conservative Brian Hagedorn was not supposed to even be competitive in this race. Republican groups abandoned him (always finding ways to try to lose) and refused to spend money on his campaign. Instead, he now holds a 5,000+ vote lead over liberal-backed Lisa Neubauer with 99% of precincts reporting.
'' A conservative win would increase their majority to 5-2 and ensure their control over the court, which they’ve held since 2008, for years to come. It would be a particularly stinging defeat for liberals, who were confident and riding a wave of wins in 2018, including picking up a Supreme Court seat and ousting Republican Gov. Scott Walker. Here's the whole speech, if you're interested. From Blue Collar Logic, an interesting take on Trump. He's our nations immune system response. BREAKING: White House To TARGET Illegal Alien Money Transfers Out of U.S. The White House is planning on targeting the tens of billions of dollars in “remittance payments” sent by illegal immigrants back to their home countries, in the wake of an ongoing migrant flood at the U.S. Southern border, a senior administration official told reporters Tuesday. Temporary halt to all remittances to Mexico until that government halts caravans and enforces border controls to U.S. The White House plan to go after remittance payments falls in line with a proposal from former Kansas Secretary of State Kris Kobach, who is being considered to replace outgoing DHS Secretary Kirstjen Nielsen. Mexico received the most, at a record $30 billion in 2018….and the three Northern Triangle nations targeted by President Trump’s funding threat over illegal immigration, Guatemala, El Salvador, and Honduras, received over $16 billion, according to an analysis by the Pew Research Center. I spoke with a Senate staffer who said he is “stunned” that Trump is going after these cash outflows, and that is “signals a major hardening of enforcement” in the wake of his shakeup at DHS. POTUS: WE BEAT THEM, WE FIGHT BACK! A record 137.5 million Americans voted in the 2016 presidential election. A record (for midterms) 113 million Americans voted in the 2018 midterms. Let’s just use a round number somewhere in the middle, and assume that there are 125 million likely voters in the US. Each 1% that is added to Trump’s approval rating roughly translates to approximately 1.25 MILLION American voters who have changed their opinion and have started to view POTUS more favorably. This was likely the public realization of the Mueller investigation findings, combined with the red-pilling efforts to which Q (and anons) have been pursuing. 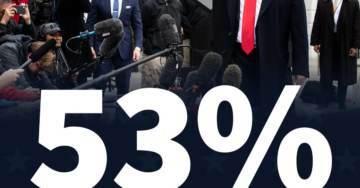 President Trump had a monthly job approval rating from Rasmussen of 48 percent in March and is now at 53%. A 5% increase translates 6.25 MILLION million. These are just the likely voters in the US. Think about the numbers WW. These numbers always fluctuate and are subject to a margin of error. But it’s likely this number will only go up as we go on from here, and as more information trickles out. People who have been red-pilled, and who are starting to understand what the Fake News Media is all about, will not likely be fooled again. Great progress POTUS, Q and Anons!!!! Surely just a coincidence President Trump just promised to dump fresh illegal aliens right into the wealthiest communities in sanctuary cities. I took the standard deduction this year and paid $2000 less in taxes than last year when I itemized. I'm not complaining about that but taxation is theft! Patriots and the US flag take the win in Laguna Beach. I just saw the clip on Fox News about the City Council vote. It was awesome. Patriotic residents showed their support by singing the National Anthem during the vote on whether to keep the US flag decals on the police cars. Councilman said that when the issue went national, they were getting 99% in support of the flag. He said while council meetings are usually filled with dissenters, they didn't even bother to show up for this vote. They knew they'd lost. *The number of Americans filing applications for unemployment benefits fell to more than a 49-1/2-year low last week. *The data pointed to sustained strength in the economy. *Initial claims for state unemployment benefits dropped to 192,000 for the week ended April 13, the lowest level since September 1969, the Labor Department said. The number of Americans filing applications for unemployment benefits fell to more than a 49-1/2-year low last week, pointing to sustained strength in the economy. Initial claims for state unemployment benefits dropped 5,000 to a seasonally adjusted 192,000 for the week ended April 13, the lowest level since September 1969, the Labor Department said on Thursday. Data for the prior week was revised to show 1,000 more applications received than previously reported. Claims have now declined for five straight weeks. Economists polled by Reuters had forecast claims would rise to 205,000 in the latest week. The Labor Department said no states were estimated last week. Claims tend to be volatile around this time of the year because of the different timings of the Easter holiday and spring breaks. The walls were not coming down. They were not closing in. There was, at the end of the day, no evidence whatsoever of any collusion — and there was nothing but a president frustrated at being wrongly accused and wrongly investigated over a very effective hoax. The big difference between today and what happened in 1998 or during the Nixon era is that, at the end of the day, the Mueller investigators found no stained dress, no break-in, no hush money, no enemies list. There never was a crime, and what seemed far-fetched was simply that — this time, a duly elected president was investigated for a crime that never even existed. In fact, evidence is mounting that the investigation itself was launched on phony grounds. And so, the screaming partisan antics of Democrats in the House are likely to set the Democratic Party back a decade if they do not get a grip on themselves. In partisan unison, with scripted talking points, they keep calling everyone else “partisan.” It simply does not pass the laugh test at this point. It will take some Democrats of courage to turn this off and stop the abuse of going after the president’s financial records. These are the kinds of things Nixon was doing, and there is no justification for those in Congress to be doing exactly those things for which Nixon resigned from office — going after his political enemies. As I predicted in earlier columns, the Mueller report was always going to try to paint a picture of obstruction of justice. It was a lot weaker than I thought it would be because the alleged acts of obstruction are nothing more than acts the president could have legally taken or ordered. While talking a tough game publicly and brooding in private, the president and his legal team gave unprecedented access to White House documents and personnel. In fact, the event that triggered the appointment of the special counsel — the firing of former FBI Director James Comey — didn’t even merit much discussion in the report, raising again the question of why there ever was a Mueller investigation whose focus was Trump and his campaign. Even if you believe Mueller should have been appointed given the swirl of questions kicked up about Russia, Volume 2 of the Mueller report should not exist at all, once investigators determined there was no collusion and they were not issuing any charges. Mark Penn served as pollster and adviser to President Clinton from 1995 to 2000, including during Clinton’s impeachment.